Wandin is a rural town 42 km east of Melbourne and 8 km beyond Lilydale. There are adjoining agricultural districts of Wandin North and (eastwards), Wandin Yallock. The name is first recorded in the Parish of Wandin Yallock, surveyed 1866-68. The parish survey reserved a site for a township about 1 km south of the present township, but the coming of the railway in 1901 resulted in the township being built in its present position. Wandin and Yallock are thought to be Aboriginal words for running water or running stream. The Land Act 1869 provided for farmers to purchase or lease relatively small holdings, which was feasible with Wandin's soil and regular rainfall. Fruit and vegetables were grown extensively, with raspberries doing well. A jam factory was opened in the 1870s, others followed in the following decade and pulp was exported interstate and overseas. Passionfruit were grown commercially from 1892 to 1920. The influence of Methodist churches and the Rechabites kept Wandin free of hotels and wine saloons. (The railway had opened in 1901). Water supply for the Wandin township was provided in 1930 from the O'Shannassy Dam, although the water aqueduct had been built in 1913 passing through Wandin on its way to Melbourne's eastern suburbs. Electricity was connected in 1952. The town on the railway line and Maroondah Highway was named Wandin. Wandin North was north of the railway and Wandin Yallock and Wandin East were south-east of the town. Since the mid-2000s the town has become Wandin North, and its perimeter includes Wandin Yallock. Wandin East remains, but there is no ‘Wandin’ in modern street directories. The census districts (2011) had the same names but different boundaries from the street directories. Residents probably do not care, but quite a few prefer ‘Wandin Yallock’. 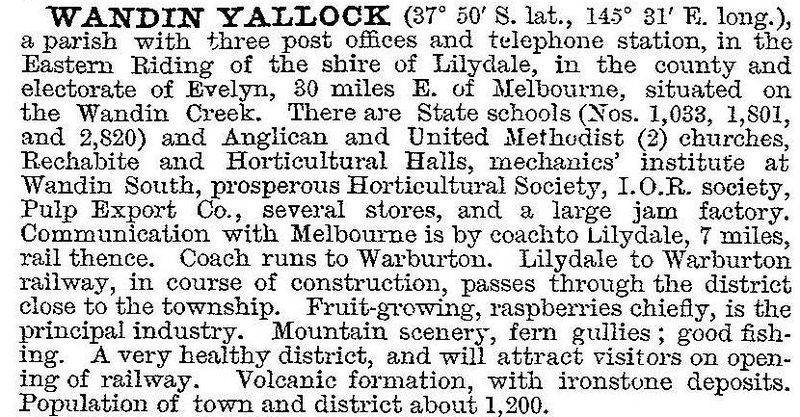 ‘Wandin Yallock South’ was the original name of Silvan, and its school opened in 1876. Wandin township has a small drive-in shopping centre, a hall, community house, senior citizen's centre and several reserves. The largest, with an oval, is the Wandin North reserve. The Wandin North district and the Wandin North school are about 2 km north-west of ‘Wandin’. Wandin Yallock primary school, war memorial and Uniting church are about 1 km south-east of ‘Wandin’. About 3 km further south-east is Wandin East with a reserve, hall and recreation facilities. The popular television series A Country Practice in Wandin Valley was not from Wandin, Victoria, but was in a New South Wales setting. The actual town was Windsor.